spinal & extremity adjusting techniques, and a variety of public health-related areas. The primary focus of the chiropractic education is to teach the student how to recognize and effectively treat a wide variety of soft tissue disorders in order to reduce pain and discomfort, allow for effective healing and reduce scar formation, restore normal joint biomechanics and improve overall health. In order to treat such conditions, students are taught a number of different techniques and methods including chiropractic spinal adjusting techniques. Students review the scientific literature on how adjustments positively influence the body and organ systems through the neurological system. An emphasis is also placed on other aspects of health including stressors, diet, exercise, nutrition and wellness. Furthermore, students receive comprehensive training identifying those conditions which are beyond the Chiropractic scope of practice and which require outside Medical referral. In addition, students must spend several hundred hours of internship in which they treat patients suffering from true health ailments while under professional supervision. Some schools actually begin introducing and training students in the clinical setting while in their second year of studies. This ensures that the graduating doctors of chiropractic will have all the necessary education, skills and clinical experience to provide exceptionally safe and effective chiropractic health care. Many colleges have additionally employed externship programs in which student doctors assist field doctors in their private practices prior to graduation, as well as hospital rounds in conjunction with medical students. Click here for further information from the Federation of Canadian Chiropractic (CFCREAB). Click here for further information from the Canadian Chiropractic Examining Board (CCEB). 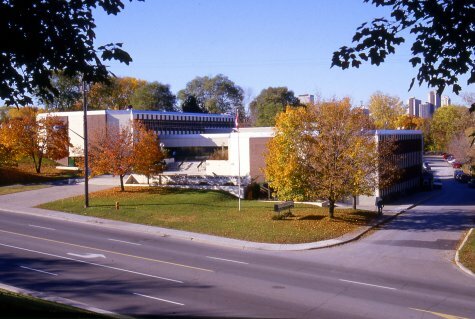 For further information regarding The Canadian Memorial Chiropractic College, Dr. Pisareks 'alma mater' (1976), please click here. Once licensed, chiropractors attend annual seminars in order to maintain a high level of competency and keep technical skills sharp and as current as possible. Many doctors further their knowledge and skills by completing post-doctoral certifications and education. These one to three year programs provide the information to place the doctors at the pinnacle of the health care field. Some of the areas of study include orthopedics, neurology, spine trauma, radiology, sports, rehabilitation, nutrition, pediatrics and research. After completion of the coursework, as well as passing written and practical exams, doctors receive certification. Some certifications are denoted with additional initials or credentialing. Many are surprised to learn that chiropractic physicians receive more didactic study compared to their medical counterparts in various important subjects. The largest differences are due to the fact that medical physicians are trained more in emergency, pathology, pharmacology, and surgery. Chiropractors are trained more in diagnosis, neurology, rehabilitation, radiology, and joint manipulation. The respective differences are important due to the separate and distinct roles each doctor provides for the patient, and the community as a whole. Have you ever wondered just how much education your chiropractor has? The facts may very well surprise you. Today, highly specialized training is required to graduate and earn licensure, and chiropractic has gained recognition as a comprehensive, scientifically sound force among the healing arts. Only chiropractic concerns itself with the interrelationship of structure and physiological functioning. A chiropractic program consists of 4 academic years of professional education averaging a total of 4,822 hours, and ranging from 4,400 hours to 5,220 hours in the 16 colleges.1 This includes an average of 1,975 hours in clinical sciences and 1,405 hours of clinical clerkship. The minimum hours for accreditation by the Council on Chiropractic Education is 4,200 hours. A recent study comparing chiropractic and medical education collected data on all chiropractic and medical schools in North America and performed an in-depth analysis of three chiropractic and three medical schools (Coulter, submitted). Three States providing a broad geographic representation of the United States were chosen: California, Iowa, and Texas. These States account for almost half of the chiropractic colleges in the United States. A single chiropractic college and school of medicine were studied in each State. The chiropractic schools included in this study had enrollments of 521, 773, and 1880, compared with a mean enrollment for all colleges of 878 (CCE Report, 1996). The three medical schools had enrollments of 691, 734, and 745, all moderately above the national average of 536 (JAMA, 1995). There are a lot of myths about chiropractic care...I decided to look into each of these myths, and what I found is that chiropractic education, side-by-side, is more similar to medical education than it is dissimilar. - Jack Zigler, MD, orthopedic spine surgeon. Two questions are of paramount importance in comparing the curricula of the two professions; what subjects are taught and how much is taught? The two programs are relatively similar in total student contact hours: an average of 4,822 hours in chiropractic schools compared with 4,667 hours in medical schools (Coulter, et al, submitted). 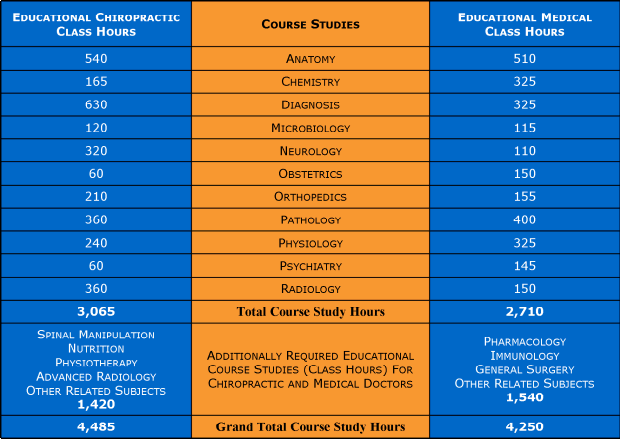 Basic science comprises 25-30 percent of the total contact hours in both the chiropractic and medical programs (Table 1) and the two programs have roughly similar contact hours in biochemistry, microbiology, and pathology (Table 2). Chiropractors receive substantially more hours in anatomy education and physiology but many fewer in public health. The contrast between the two programs is dramatic in the area of clinical clerkships, which averaged 3,467 hours in medicine versus 1,405 hours in chiropractic. In medicine this comprises, on average, 74 percent of the total contact hours, while in chiropractic it comprises only 29 percent (Table 1). Part of the difference can be explained by the way in which the programs are structured. In chiropractic 41 percent of the program (averaging 1,975 hours) is allocated to chiropractic clinical sciences, which consists of extensive laboratory and hands-on training in manual procedures and has no equivalent in medicine. Combining the chiropractic clinical sciences with the clinical clerkships, the percentage of a chiropractic program devoted to clinical education is 70 percent compared to medicine's 74 percent. The major difference therefore is in didactic teaching and clinical experience. Thus, on average, medical students receive twice the number of hours in clinical experience but receive over 1,000 fewer hours in lectures and laboratory education. If the medical residency is included, the total number of hours of clinical experience for medicine rises to 6,413 (Coulter, submitted). Source: Center for Studies in Health Policy, Inc., Washington, DC. Personal communication of 1995 unpublished data from Meredith Gonyea, PhD.